These tumors are classified as per WHO- EORTC classification for cutaneous lymphomas into following categories. Aggressive form of cutaneous T cell lymphoma characterized by erythroderma, generalized lymphadenopathy and circulating Sezary cells. , Previous history of MF excludes the diagnosis of Sezary syndrome. The International Society for Cutaneous Lymphomas (ISCL), has laid down following criteria for the diagnosis of Sezary syndrome. Type A: Few clusters of CD 30+ cells in an inflammatory background. Type B: Small cells with convoluted nuclei infiltrating into the epidermis, type B cells are CD3/CD4+, do not express CD30. Systemic chemotherapy is the preferred modality of treatment. This encompasses all those lymphomas which are not included in any of the defined entities. CD 3+ and CD 4+, CD2, CD7, CD 8 expression is not seen. Dense infiltrate of small cleaved cells in the dermis and extension into the subcutaneous tissue. Epidermis is relatively spared. Plasma cells, plasmacytoid cells, and reactive chronic inflammatory infiltrate are also noted. Role of infectious agent is questionable with Borrelia species being identified in some studies. The closest differential diagnosis is primary cutaneous follicular center cell lymphoma. On the basis of infiltration pattern, three types are identified. Diffuse, nodular and band like. Apart from lymphocytic infiltrate, plasma cells and macrophages are also seen within the infiltrate. Germinal centers are identified except in diffuse type. [Figure 5]a and b. 1. Bradford PT, Devesa SS, Anderson WF, Toro JR. Cutaneous lymphoma incidence patterns in the United States: A population-based study of 3884 cases. Blood 2009;113:5064-73. 2. Willemze R, Jaffe ES, Burg G, Cerroni L, Berti E, Swerdlow SH, et al. WHO-EORTC classification for cutaneous lymphomas. Blood 2005;105:3768-85. 3. Hsu MY, Murphy GF. 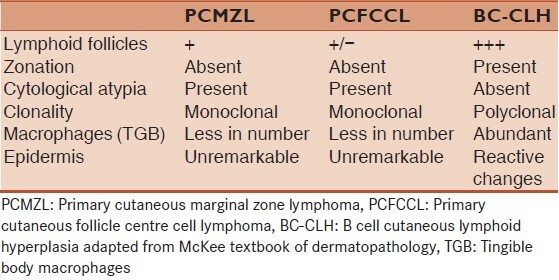 Cutaneous lymphomas and leukemias. In: Elder ED, editor. Levers histopathology of the skin. Philadelphia: Lippincott and William Wilkins; 2009. p. 911-68. 4. Diamandidou E, Colome-Grimmer M, Fayad L, Duvic M, Kurzrock R. Transformation of mycosis fungoides/Sezary syndrome: Clinical characteristics and prognosis. Blood 1998;92:1150-9. 5. Berti E, Tomasini D, Vermeer MH, Meijer CJ, Alessi E, Willemze R. Primary cutaneous CD8-positive epidermotropic cytotoxic T cell lymphomas. A distinct clinicopathological entity with an aggressive clinical behavior. Am J Pathol 1999;155:483-92. 6. Ralfkiaer E. Immunohistological markers for the diagnosis of cutaneous lymphomas. Semin Diagn Pathol 1991;8:62-72. 7. Vermeer MH, Geelen FA, Kummer JA, Meijer CJ, Willemze R. Expression of cytotoxic proteins by neoplastic T cells in mycosis fungoides increases with progression from plaque stage to tumor stage disease. Am J Pathol 1999;154:1203-10. 8. Smoller BR, Santucci M, Wood GS, Whittaker SJ. Histopathology and genetics of cutaneous T-cell lymphoma. Hematol Oncol Clin North Am 2003;17:1277-311. 9. Jones GW, Kacinski BM, Wilson LD, Willemze R, Spittle M, Hohenberg G, et al. Total skin electron radiation in the management of mycosis fungoides: Consensus of the European Organization for Research and Treatment of Cancer (EORTC) Cutaneous Lymphoma Project Group. J Am Acad Dermatol 2002;47:364-70. 10. Whittaker SJ, Marsden JR, Spittle M, Russell Jones R. British Association of Dermatologists. U.K. Cutaneous Lymphoma Group. Joint British Association of Dermatologists and U.K. Cutaneous Lymphoma Group guidelines for the management of primary cutaneous T-cell lymphomas. Br J Dermatol 2003;149:1095-107. 11. Flaig MJ, Cerroni L, Schuhmann K, Bertsch HP, Kind P, Kaudewitz P, et al. Follicular mycosis fungoides. A histopathologic analysis of nine cases. J Cutan Pathol 2001;28:525-30. 12. van Doorn R, Scheffer E, Willemze R. Follicular mycosis fungoides, a distinct disease entity with or without associated follicular mucinosis: A clinicopathologic and follow-up study of 51 patients. Arch Dermatol 2002;138:191-8. 13. Mielke V, Wolff HH, Winzer M, Sterry W. Localized and disseminated pagetoid reticulosis. Diagnostic immunophenotypical findings. Arch Dermatol 1989;125:402-6. 14. Haghighi B, Smoller BR, LeBoit PE, Warnke RA, Sander CA, Kohler S. Pagetoid reticulosis (Woringer-Kolopp disease): An immunophenotypic, molecular, and clinicopathologic study. Mod Pathol 2000;13:502-10. 15. In: Jaffe ES, Harris NL, Stein H, Vardiman JW, editors. World Health Organization Classification of Tumors: Pathology and Genetics of Tumours of Hematopoietic and Lymphoid Tissues. France: IARC Press; 2007. 16. LeBoit PE. Granulomatous slack skin. Dermatol Clin 1994;12:375-89. 17. Vonderheid EC, Bernengo MG, Burg G, Duvic M, Heald P, Laroche L, et al. ISCL. Update on erythrodermic cutaneous T-cell lymphoma: Report of the International Society for Cutaneous Lymphomas. J Am Acad Dermatol 2002;46:95-106. 18. Wieselthier JS, Koh HK. Sézary syndrome: Diagnosis, prognosis, and critical review of treatment options. J Am Acad Dermatol 1990;22:381-401. 19. Mao X, Orchard G, Lillington DM, Russell-Jones R, Young BD, Whittaker SJ. Amplification and overexpression of JUNB is associated with primary cutaneous T-cell lymphomas. Blood 2003;101:1513-9. 20. Russell-Jones R. Extracorporeal photopheresis in cutaneous T-cell lymphoma. Inconsistent data underline the need for randomized studies. Br J Dermatol 2000;142:16-21. 21. Kazakov DV, Burg G, Kempf W. Clinicopathological spectrum of mycosis fungoides. J Eur Acad Dermatol Venereol 2004;18:397-415. 22. Broder S, Bunn PA Jr, Jaffe ES, Blattner W, Gallo RC, Wong-Staal F, et al. NIH conference. T-cell lymphoproliferative syndrome associated with human T-cell leukemia/lymphoma virus. Ann Intern Med 1984;100:543-57. 23. Yamaguchi K. Human T-lymphotropic virus type I in Japan. Lancet 1994;343:213-6. 24. Shimoyama M. Diagnostic criteria and classification of clinical subtypes of adult T-cell leukaemia-lymphoma. A report from the Lymphoma Study Group (1984-87). Br J Haematol 1991;79:428-37. 25. Ohshima K, Mukai Y, Shiraki H, Suzumiya J, Tashiro K, Kikuchi M. Clonal integration and expression of human T-cell lymphotropic virus type I in carriers detected by polymerase chain reaction and inverse PCR. Am J Hematol 1997;54:306-12. 26. Yamada Y, Tomonaga M. The current status of therapy for adult T-cell leukaemia-lymphoma in Japan. Leuk Lymphoma 2003;44:611-8. 27. Bekkenk MW, Geelen FA, van Voorst Vader PC, Heule F, Geerts ML, van Vloten WA, et al. Primary and secondary cutaneous CD30 (+) lymphoproliferative disorders: A report from the Dutch Cutaneous Lymphoma Group on the long-term follow-up data of 219 patients and guidelines for diagnosis and treatment. Blood 2000;95:3653-61. 28. Kummer JA, Vermeer MH, Dukers D, Meijer CJ, Willemze R. Most primary cutaneous CD30-positive lymphoproliferative disorders have a CD4-positive cytotoxic T-cell phenotype. J Invest Dermatol 1997;109:636-40. 29. Willemze R, Kerl H, Sterry W, Berti E, Cerroni L, Chimenti S, et al. EORTC classification for primary cutaneous lymphomas: A proposal from the Cutaneous Lymphoma Study Group of the European Organization for Research and Treatment of Cancer. Blood 1997;90:354-71. 30. DeCoteau JF, Butmarc JR, Kinney MC, Kadin ME. The t (2;5) chromosomal translocation is not a common feature of primary cutaneous CD30+lymphoproliferative disorders: Comparison with anaplastic large-cell lymphoma of nodal origin. Blood 1996;87:3437-41. 31. Willemze R, Jansen PM, Cerroni L, Berti E, Santucci M, Assaf C, et al. EORTC Cutaneous Lymphoma Group. Subcutaneous panniculitis-like T-cell lymphoma: Definition, classification, and prognostic factors: An EORTC Cutaneous Lymphoma Group Study of 83 cases. Blood 2008;111:838-45. 32. Marzano AV, Berti E, Paulli M, Caputo R. Cytophagic histiocytic panniculitis and subcutaneous panniculitis-like T-cell lymphoma: Report of 7 cases. Arch Dermatol 2000;136:889-96. 33. Massone C, Chott A, Metze D, Kerl K, Citarella L, Vale E, et al. Subcutaneous, blastic natural killer (NK), NK/T-cell, and other cytotoxic lymphomas of the skin: A morphologic, immunophenotypic, and molecular study of 50 patients. Am J Surg Pathol 2004;28:719-35. 34. Salhany KE, Macon WR, Choi JK, Elenitsas R, Lessin SR, Felgar RE, et al. Subcutaneous panniculitis-like T-cell lymphoma: Clinicopathologic, immunophenotypic, and genotypic analysis of alpha/beta and gamma/delta subtypes. Am J Surg Pathol 1998;22:881-93. 35. Miyamoto T, Yoshino T, Takehisa T, Hagari Y, Mihara M. Cutaneous presentation of nasal/nasal type T/NK cell lymphoma: Clinicopathological findings of four cases. Br J Dermatol 1998;139:481-7. 36. Jaffe ES, Krenacs L, Raffeld M. Classification of cytotoxic T-cell and natural killer cell lymphomas. Semin Hematol 2003;40:175-84. 37. Kwong YL, Chan AC, Liang R, Chiang AK, Chim CS, Chan TK, et al. CD56+NK lymphomas: Clinicopathological features and prognosis. Br J Haematol 1997;97:821-9. 38. Cheung MM, Chan JK, Lau WH, Foo W, Chan PT, Ng CS, et al. Primary non-Hodgkin′s lymphoma of the nose and nasopharynx: Clinical features, tumor immunophenotype, and treatment outcome in 113 patients. J Clin Oncol 1998;16:70-7. 39. Natkunam Y, Smoller BR, Zehnder JL, Dorfman RF, Warnke RA. Aggressive cutaneous NK and NK-like T-cell lymphomas: Clinicopathologic, immunohistochemical, and molecular analyses of 12 cases. Am J Surg Pathol 1999;23:571-81. 40. Teruya-Feldstein J, Jaffe ES, Burd PR, Kanegane H, Kingma DW, Wilson WH, et al. The role of Mig, the monokine induced by interferon-gamma, and P-10, the interferon-gamma-inducible protein-10, in tissue necrosis and vascular damage associated with Epstein-Barr virus-positive lymphoproliferative disease. Blood 1997;90:4099-105. 41. Chan JK. Natural killer cell neoplasms. Anat Pathol 1998;3:77-145. 42. Bekkenk MW, Jansen PM, Meijer CJ, Willemze R. CD56+Hematological neoplasms presenting in the skin: A retrospective analysis of 23 new cases and 130 cases from the literature. Ann Oncol 2004;15:1097-108. 43. Gormley RH, Hess SD, Anand D, Junkins-Hopkins J, Rook AH, Kim EJ. Primary cutaneous aggressive epidermotropic CD8+T-cell lymphoma. J Am Acad Dermatol 2010;62:300-7. 44. Ohmatsu H, Sugaya M, Fujita H, Miyagaki T, Kadono T, Maeda D, et al. Primary cutaneous CD8+aggressive epidermotropic cytotoxic T-cell lymphoma in a human T-cell leukaemia virus type-1 carrier. Acta Derm Venereol 2010;90:324-5. 45. Garcia-Herrera A, Song JY, Chuang SS, Villamor N, Colomo L, Pittaluga S, et al. Nonhepatosplenic γδ T-cell lymphomas represent a spectrum of aggressive cytotoxic T-cell lymphomas with a mainly extranodal presentation. Am J Surg Pathol 2011;35:1214-25. 46. Toro JR, Liewehr DJ, Pabby N, Sorbara L, Raffeld M, Steinberg SM, et al. Gamma-delta T-cell phenotype is associated with significantly decreased survival in cutaneous T-cell lymphoma. Blood 2003;101:3407-12. 47. Bekkenk MW, Vermeer MH, Jansen PM, van Marion AM, Canninga-van Dijk MR, Kluin PM, et al. Peripheral T-cell lymphomas unspecified presenting in the skin: Analysis of prognostic factors in a group of 82 patients. Blood 2003;102:2213-9. 48. Petrella T, Dalac S, Maynadié M, Mugneret F, Thomine E, Courville P, et al. CD4+CD56+cutaneous neoplasms: A distinct hematological entity? Groupe Français d′Etude des Lymphomes Cutanés (GFELC). Am J Surg Pathol 1999;23:137-46. 49. Petrella T, Comeau MR, Maynadié M, Couillault G, De Muret A, Maliszewski CR, et al. ′Agranular CD4+CD56+hematodermic neoplasm′ (blastic NK-cell lymphoma) originates from a population of CD56+precursor cells related to plasmacytoid monocytes. Am J Surg Pathol 2002;26:852-62. 50. Chaperot L, Bendriss N, Manches O, Gressin R, Maynadie M, Trimoreau F, et al. Identification of a leukemic counterpart of the plasmacytoid dendritic cells. Blood 2001;97:3210-7. 51. Pilichowska ME, Fleming MD, Pinkus JL, Pinkus GS. CD4+/CD56+hematodermic neoplasm ("blastic natural killer cell lymphoma"): Neoplastic cells express the immature dendritic cell marker BDCA-2 and produce interferon. Am J Clin Pathol 2007;128:445-53. 52. Petrella T, Bagot M, Willemze R, Beylot-Barry M, Vergier B, Delaunay M, et al. Blastic NK-cell lymphomas (agranular CD4+CD56+hematodermic neoplasms): A review. Am J Clin Pathol 2005;123:662-75. 53. Cho-Vega JH, Vega F, Rassidakis G, Medeiros LJ. Primary cutaneous marginal zone B-cell lymphoma. Am J Clin Pathol 2006;125 Suppl: S38-49. 54. Sroa N, Magro CM. Pediatric primary cutaneous marginal zone lymphoma: In association with chronic antihistamine use. J Cutan Pathol 2006;33 Suppl 2:1-5. 55. Dargent JL, Devalck C, De Mey A, Vandeweyer E, Lespagnard L, Heimann P. Primary cutaneous marginal zone B-cell lymphoma of MALT type in a child. Pediatr Dev Pathol 2006;9:468-73. 56. Takino H, Li C, Hu S, Kuo TT, Geissinger E, Muller-Hermelink HK, et al. Primary cutaneous marginal zone B-cell lymphoma: A molecular and clinicopathological study of cases from Asia, Germany, and the United States. Mod Pathol 2008;21:1517-26. 57. Cerroni L, Zöchling N, Pütz B, Kerl H. Infection by Borrelia burgdorferi and cutaneous B-cell lymphoma. J Cutan Pathol 1997;24:457-61. 58. Schreuder MI, Hoefnagel JJ, Jansen PM, van Krieken JH, Willemze R, Hebeda KM. FISH analysis of MALT lymphoma-specific translocations and aneuploidy in primary cutaneous marginal zone lymphoma. J Pathol 2005;205:302-10. 59. Streubel B, Vinatzer U, Lamprecht A, Raderer M, Chott A. T (3;14)(p14.1;q32) involving IGH and FOXP1 is a novel recurrent chromosomal aberration in MALT lymphoma. Leukemia 2005;19:652-8. 60. Hoefnagel JJ, Vermeer MH, Jansen PM, Heule F, van Voorst Vader PC, Sanders CJ, et al. Primary cutaneous marginal zone B-cell lymphoma: Clinical and therapeutic features in 50 cases. Arch Dermatol 2005;141:1139-45. 61. Roggero E, Zucca E, Mainetti C, Bertoni F, Valsangiacomo C, Pedrinis E, et al. Eradication of Borreliaburgdorferi infection in primary marginal zone B-cell lymphoma of the skin. Hum Pathol 2000;31:263-8. 62. Senff NJ, Hoefnagel JJ, Jansen PM, Vermeer MH, van Baarlen J, Blokx WA, et al. Reclassification of 300 primary cutaneous B-Cell lymphomas according to the new WHO-EORTC classification for cutaneous lymphomas: Comparison with previous classifications and identification of prognostic markers. J Clin Oncol 2007;25:1581-7. 63. Berti E, Alessi E, Caputo R, Gianotti R, Delia D, Vezzoni P. Reticulohistiocytoma of the dorsum. J Am Acad Dermatol 1988;19:259-72. 64. Cerroni L, Arzberger E, Pütz B, Höfler G, Metze D, Sander CA, et al. Primary cutaneous follicle center cell lymphoma with follicular growth pattern. Blood 2000;95:3922-8. 65. Dijkman R, Tensen CP, Buettner M, Niedobitek G, Willemze R, Vermeer MH. Primary cutaneous follicle center lymphoma and primary cutaneous large B-cell lymphoma, leg type, are both targeted by aberrant somatic hypermutation but demonstrate differential expression of AID. Blood 2006;107:4926-9. 66. Dias Coelho J, Diamantino F, Costa I, Farinha P, Gameiro P, Sebastião M, et al. Transformation of a cutaneous follicle center lymphoma to a diffuse large B-cell lymphoma-an unusual presentation. Case Rep Med 2010;2010:296523. 67. Rijlaarsdam JU, Toonstra J, Meijer OW, Noordijk EM, Willemze R. Treatment of primary cutaneous B-cell lymphomas of follicle center cell origin: A clinical follow-up study of 55 patients treated with radiotherapy or polychemotherapy. J Clin Oncol 1996;14:549-55. 68. Golling P, Cozzio A, Dummer R, French L, Kempf W. Primary cutaneous B-cell lymphomas-clinicopathological, prognostic and therapeutic characterisation of 54 cases according to the WHO-EORTC classification and the ISCL/EORTC TNM classification system for primary cutaneous lymphomas other than mycosis fungoides and Sezary syndrome. Leuk Lymphoma 2008;49:1094-103. 69. Vermeer MH, Geelen FA, van Haselen CW, van Voorst Vader PC, Geerts ML, van Vloten WA, et al. Primary cutaneous large B-cell lymphomas of the legs. A distinct type of cutaneous B-cell lymphoma with an intermediate prognosis. Dutch Cutaneous Lymphoma Working Group. Arch Dermatol 1996;132:1304-8. 70. Hembury TA, Lee B, Gascoyne RD, Macpherson N, Yang B, House N, et al. Primary cutaneous diffuse large B-cell lymphoma: A clinicopathologic study of 15 cases. Am J Clin Pathol 2002;117:574-80. 71. Hristov AC. Primary cutaneous diffuse large B-cell lymphoma, leg type: Diagnostic considerations. Arch Pathol Lab Med 2012;136:876-81. 72. Hoefnagel JJ, Dijkman R, Basso K, Jansen PM, Hallermann C, Willemze R, et al. Distinct types of primary cutaneous large B-cell lymphoma identified by gene expression profiling. Blood 2005;105:3671-8. 73. Grange F, Bekkenk MW, Wechsler J, Meijer CJ, Cerroni L, Bernengo M, et al. Prognostic factors in primary cutaneous large B-cell lymphomas: A European multicentre study. J Clin Oncol 2001;19:3602-10. 74. Kodama K, Massone C, Chott A, Metze D, Kerl H, Cerroni L. Primary cutaneous large B-cell lymphomas: Clinicopathologic features, classification, and prognostic factors in a large series of patients. Blood 2005;106:2491-7. 75. Pfleger V, Tappeiner J. Zur Kenntnis der systemisierten Endotheliomatoseder cutanen Blutgefa¨ ße (Reticuloendotheliose?). Hautarzt 1959;10:363-9. 76. Murase T, Yamaguchi M, Suzuki R, Okamoto M, Sato Y, Tamaru J, et al. Intravascular large B-cell lymphoma (IVLBCL): A clinicopathologic study of 96 cases with special reference to the immunophenotypic heterogeneity of CD5. Blood 2007;109:478-85. 77. Orwat DE, Batalis NI. Intravascular large B-cell lymphoma. Arch Pathol Lab Med 2012;136:333-8. 78. Ponzoni M, Arrigoni G, Gould VE, Del Curto B, Maggioni M, Scapinello A, et al. Lack of CD 29 (beta1 integrin) and CD 54 (ICAM-1) adhesion molecules in intravascular lymphomatosis. Hum Pathol 2000;3:220-6. 79. Kanda M, Suzumiya J, Ohshima K, Haraoka S, Nakamura N, Abe M, et al. Analysis of the immunoglobulin heavy chain gene variable region of intravascular large B-cell lymphoma. Virchows Arch 2001;439:540-6. 80. Arai E, Shimizu M, Hirose T. A review of 55 cases of cutaneous lymphoid hyperplasia: Reassessment of the histopathologic findings leading to reclassification of 4 lesions as cutaneous marginal zone lymphoma and 19 as pseudolymphomatous folliculitis. Hum Pathol 2005;36:505-11. 81. Nihal M, Mikkola D, Horvath N, Gilliam AC, Stevens SR, Spiro TP, et al. Cutaneous lymphoid hyperplasia: A lymphoproliferative continuum with lymphomatous potential. Hum Pathol 2003;34:617-22. 82. Bergman R, Khamaysi K, Khamaysi Z, Ben Arie Y. A study of histologic and immunophenotypical staining patterns in cutaneous lymphoid hyperplasia. J Am Acad Dermatol 2011;65:112-24. 83. 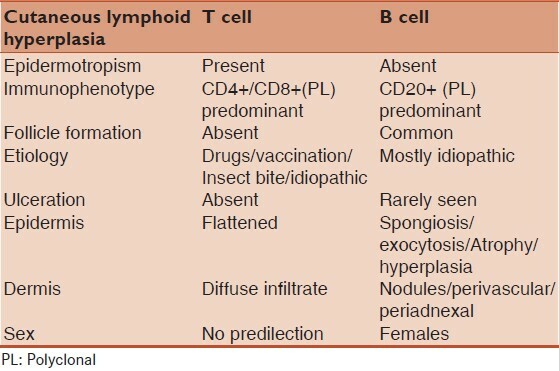 Kerl H, Fink-Puches R, Cerroni L. Diagnostic criteria of primary cutaneous B-cell lymphomas and pseudolymphomas. Keio J Med 2001;50:269-73. 84. Maubec E, Pinquier L, Viguier M, Caux F, Amsler E, Aractingi S, et al. Vaccination-induced cutaneous pseudolymphoma. J Am Acad Dermatol 2005;52:623-9.